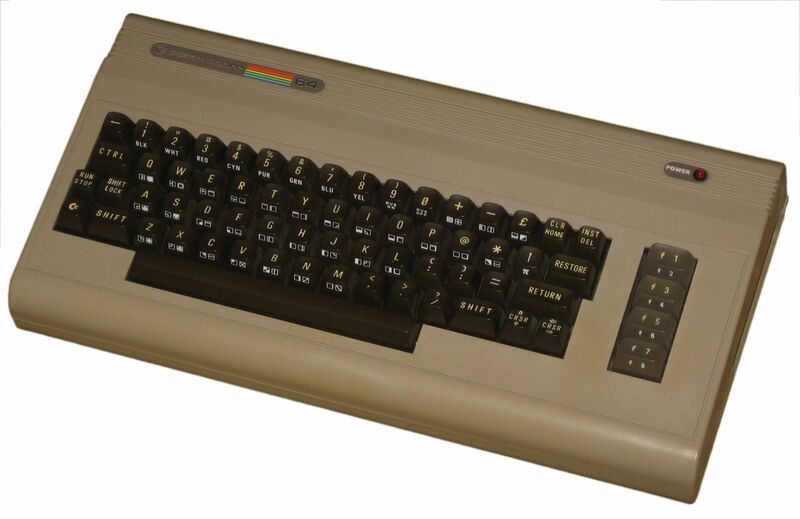 The original C64 was affectionally called Brotkasten or Breadbox, because the shape of its case actually looks a little like a certain kitchen implement. Until 1986 it was the only incarnation of the computer and the one it became most famous for. The distinctive brown case with the black keyboard and the dark brown f-keys are instantly recognizeable, but the shape was actually taken almost completely from its predecessor, the VIC-20. I finally got the one in this photo (as usual, click on it to enlarge) sometime in 2003 for just 20 or 25 Euro together with a floppy drive and a joystick. To my surprise, the computer arrived in its original packaging including the cardboard slipcase, but unfortunately I discovered that it did not work. The seller actually wanted to take it back, but I kept it anyway because the case was in almost pristine condition and the floppy and the joystick were worth the price alone. But a non-working original C64 was not really my intention despite the good-looking exterior, so I began to hunt for spare parts. Luckily, I found a dreadful-looking, red-painted (hence not pictured! ), but otherwise fully functional C64 with some more accessories which was just perfect as a donor for a heart transplant. With some minor surgery, I was able to swap the identical mainboards and put the working one in the nice-looking case – with a Commodore 64, this is thankfully no problem and only involves removing a few screws and pulling of two cables for the keyboard and the Power LED. Of course I didn’t throw the old mainboard away – I’m not really capable of finding out what’s wrong with it exactly, but at least it’s interesting to look at and I also have a spare keyboard, which was thankfully not painted red on the mainboard donor. Total cost: maybe 30 Euro. Result: a perfect original Commodore 64 with some spares, two working 1541-II floppies and two joysticks. This was certainly worth the price. This is actually the broken mainboard – a relatively early 1983 version. The front of the original packaging the broken C64 arrived in. Notice that the labels look a little different to the actual machine! The text says in German and French High Resolution Colour Graphics & Music Synthesizer.